You know that body part that you just don’t like, or that one thing you wish you could change about your appearance? How much time to you spend looking at it in the mirror, sizing it up, wishing it was smaller/more toned/different? Why is it so easy to get caught up in things about ourselves that we don’t love and miss the true beauty we possess? I realized last week that I have been doing it all wrong and for a long time. Every single solitary time I look in the mirror, or at least about 90% of the time I look in the mirror, my eyes go straight to my midsection. And just at that same moment, my mind goes to judge, critic, negativity, you name it. My mind tries to tell me if I just had a tinier waist, or if I just did some more of this or that, then I’ll be happy with this part of me. And then all my problems will disappear, right? Ha, riiiight. But that is the constant battle of the mind. The real problem is that it doesn’t just stop there. This mindset carries over into our confidence, the way we carry ourselves, maybe even our relationships. And it is all because we spend so much of our time picking away at one thing and one thing only. And in doing so, we ignore our killer smile, our telling eyes, our strong legs, etc. Long story short, we miss everything that it so unbelievably amazing about ourselves and our bodies because our eyes can only seem to see what we do not like. And so last week, I started to tweak this based on a recommendation from a blogger I follow, Natalie Hodson. (I am unable to share the video at this time due to technical issues but it is on my facebook page.) She talked a lot about loving yourself through every phase of you exactly as you are. Whether you are trying to lose weight, gain weight, grow stronger, etc. if you don’t love your body as it is today, then even when you get to that goal or milestone, or if you lose that weight, you will only find that this becomes not enough. Wherever you are, if you can’t learn to love your body, no matter how it changes, you still won’t be in love. So this is where you have to take control and turn the tables. You know that part of your body that I asked about in the beginning? You will have to ease up on it, maybe even go as far as accepting it. While the thought process may usually go, “Ugh, look at that flab” or “Oh my gosh, I am not eating another piece of chocolate this month…year!” or “Gosh, if my _____ was just _____ then______.” It’s now time to start a shift. The first part of the shift may be to find a part of your body that you love and bring your attention to that and remind yourself how amazing it is. Then maybe slowly move to that area (or for some maybe areas which can be even tougher) and start to find something positive about it. “Sure I wish my stomach was flatter, but this was the home for my babies and I wouldn’t trade that for the world.” or “My arms may be a bit flabbier than I like, but I still play one mean tennis match with them.” Etc., etc., etc. You get the point right? It’s all about changing the thoughts, changing the mindset. This may sound silly to you or you may be one of those people that doesn’t’ struggle with body image at all. But our thoughts are so powerful and they literally can make or break our world. So if our thoughts about our bodies are not loving and compassionate, then how can we be that to other people? Give it a shot. See how it fits. Maybe too it’s just a matter of recognizing how negative your thoughts may actually be. Perhaps you are so used to it that you don’t even know it’s happening. And then see if a change in the patterns of your thoughts can bring about a little more compassion to the one and only body you have to live in. You know those people you see drinking iced coffee year round and think, how the heck do they do that? Well that is the exact same way I am with ice cream. Winter, Summer, Spring or Fall, it doesn’t matter, I will gladly take a big bowl if you are offering. With it being Groundhog Day today, and a good one since the little furry guy predicted an early spring, I thought what better way to celebrate than with a new ice cream recipe! The best part? Ice Cream Maker is optional in this one. Now, THAT is good news! A while ago, I saw a recipe video of a guy making ice cream using cashews as the base. The biggest catch was that he just threw it all into the blender and then froze it for a few hours and it was a success. If it had been an infomercial, I would’ve been dialing the 800 number and asking where to sign up. Ice cream just can’t be that easy. It just can’t. I am here today to tell you that it actually is. It is possible to make this creamy decadent dessert with something as simple as your blender. However, if you do have an ice cream maker, you can use that and make this treat a bit thicker and maybe a tad more like traditional ice cream. But if not, no big deal! I tried this recipe part with an ice cream maker and part without. As long as you allow it to firm up long enough in the freezer then using just the blender is perfect. Honestly, using the ice cream maker really just causes it to be ready sooner. So I guess maybe you save a bit of time. This is the first, and definitely not the last, ice cream installment of 2016 and right now it is my favorite ice cream treat to date that I have created. Cashews have really just fascinated me these days and the versatility they have is remarkable. They can be used in so many ways for sweet and savory foods, cheeses, and more. Go ahead and celebrate that Groundhog today with a bowl of this treat! In a high powered blender, combine all ingredients but the pecans. If not using an ice cream maker, stir in pecans and place in freezer for about 4 hours, making sure to stir a bit every hour. When ready to eat, allow to thaw for about 10 minutes or so before serving. I actually do not as I don’t count calories anymore. If you are interested in getting them, there a lot of sites out there that you just plug in all the ingredients and they will calculate it all for you. Thanks Kim! Hmmm, did you use an ice cream maker or no ice cream maker? When I made it without the ice cream maker, I made sure to blend it a little longer. What was it like when it came out of the blender? And you can run a bit of hot water over the container or even defrost in the microwave if it seems to give you trouble. I had to let mine sit out a bit for sure. I have also heard to add a tsp or two of vodka to help it not harden so much. I have not tried that though! 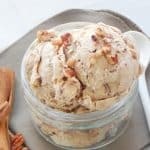 How do I make this if I already have vanilla ice cream? Hi Julia, you could just add the cinnamon and pecans and maybe a bit of maple and stir it in. Then allow to set in the freezer a bit. 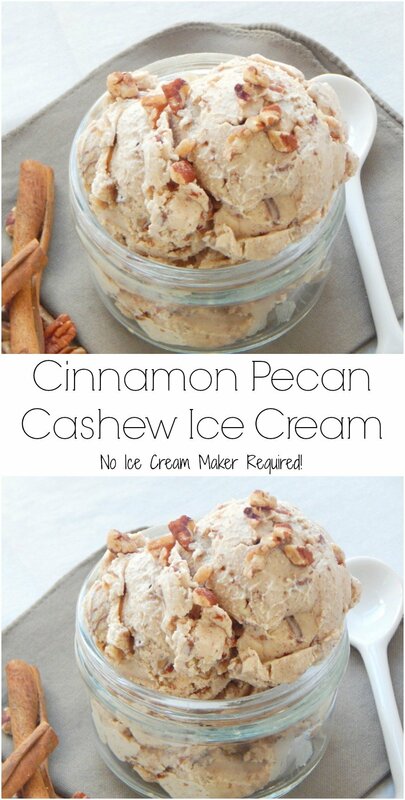 The base for this ice cream is cashews so it’s a dairy free version as well. Hi! It’s probably about 1/2 a quart, 2 cups. I have homemade cashew milk made with soaked cashews…do you this will work for the milk?! That should work for your 1 cup of milk! Thanks Lorie! And, would you say it is about 4 servings (4 people?!)?! Colleen, I would say 3-4 servings as in one full scoop being a serving. If you eat ice cream like I do then it’s more like 2 servings ? so glad you love it, Colleen! I also do a lot of banana ice cream as well when I want a good frozen treat! Hi Vicky! Great questions, definitely drain and rinse the cashews. I just put enough water to cover the cashews plus an extra inch for extra absorption. Also, I used room temperature water. Hope you love it! Hi, I made this following the recipe but the texture ended up a bit grainy, is that what it is supposed to be ? It should definitely be smooth but there are factors that could make it grainy. I used a Vitamix blender, a high powered blender is definitely best. Also, you could soak the cashews longer. But I found once I made it with a different brand cashews and it was a bit grittier. I’ve found Nuts.com cashews have worked the very best overall for me. Hope this helps!